We are among the renowned names of the business, engaged in offering Fully Automatic Auger Filler Machine. Proffered packaging machine intakes plastic film, converts it into the form of pouch, accepts the material from dispensing system and then seals the pouches, by the help of pneumatically operated heaters. 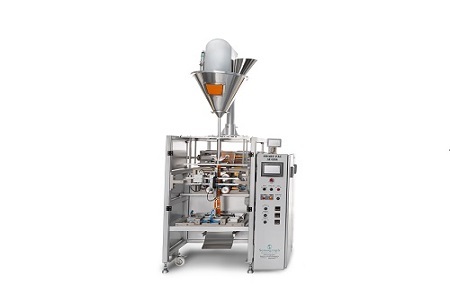 In auger filler machine, the material to be filled is stored in the hopper. The stirrer of the machine facilitates the prevention of any bridging of the material. The Servo motor drive of the machine provides the perfection of accuracy and speed of the machine. Material Construction All contact parts SS304 & other parts of MS.
Material of Construction Powder coated MS frame with all contact parts in SS304 only. Excellent screw design ensures repetitive and within range “Count” and hence weighment.